Stimulating job creation, economic growth and diversification. 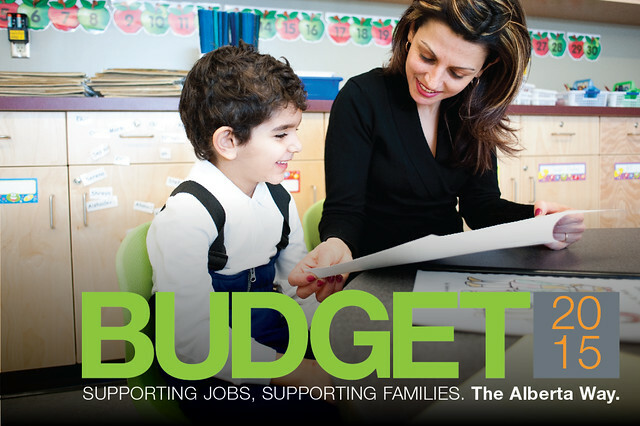 Budget 2015 includes stable funding for Alberta’s hospitals, schools and social services, reversing the previous government’s cuts to frontline services. It lays out a careful plan to return the province’s finances to balance by 2019-20. As part of government’s strategy to position Alberta as Canada’s best place to start or grow a business, Budget 2015 increases investment in infrastructure, supports trade development, and improves access to capital for small- and medium-sized businesses. A 15 per cent increase to the capital plan will put $4.5 billion more towards fixing roads, building schools and expanding hospitals in communities across the province. This ambitious infrastructure program will put Albertans back to work and support economic growth. A 15 per cent increase in capital spending over the next five years to build and repair our schools, hospitals and roads, putting Albertans back to work as the economy recovers. This increase is based on the advice of former Bank of Canada Governor David Dodge. $4.4 billion in new projects and programs that will be considered based on transparent and accountable criteria. A new two-year Job Creation Incentive Program will provide Alberta employers with grants of up to $5,000 for each new job. It will support up to 27,000 new jobs each year, through to 2017. A new Ministry of Economic Development and Trade to expand Alberta’s access to foreign and domestic markets. Budget 2015 stabilizes Alberta’s public health care system with predictable, long-term funding while getting the annual growth of the health budget under control. $120 million over two years (starting in 2016-17) for new long-term care spaces. $90 million over two years (starting in 2016-17) to expand public homecare. $10 million annually to support mental health services. Increased support for seniors’ health care, including drug, dental, optical and supplemental health benefits. Budget 2015 demonstrates a strong commitment to students and families by ensuring children have good schools, enough teachers and every opportunity to succeed. Stable and predictable funding for our schools will fully cover growth in student enrolment. Approximately 380 more teachers and 150 more support staff added to the education system. More support for students with special needs in the form of educational assistants and other classroom supports. A new school nutrition program to support families and give kids a healthy start. A $45 million annual investment to reduce the burden of school fees for families, beginning in 2016. Budget 2015 provides stable funding for the post-secondary system, supporting an estimated 250,000 full and part-time students and apprentices. A two-year tuition freeze for post-secondary students to help ensure more Albertans have access to affordable higher education. $228 million for Student Aid programs in 2015-16, to support scholarships for about 47,500 students and grants for about 16,000 students. $579 million in student loans will be disbursed to more than 77,000 students in 2015-16. More support for children in care, helping vulnerable families with new funding for the Family and Community Support Services program. New annual funding of $15 million to support women’s shelters. Increased support for people with disabilities, child intervention, child care, and homeless and outreach supports. An enhanced Alberta Family Employment Tax Credit (AFETC) to provide lower and middle-income working families with additional support. A new Alberta Child Benefit to help lower and middle income families make ends meet. Budget 2015 introduces new measures to reduce Alberta’s reliance on non-renewable resource revenue and protects Alberta’s overall tax advantage. Albertans will continue to pay the lowest overall taxes compared to other provinces with no provincial sales tax, no payroll tax, no health care premiums, and the lowest gasoline tax. A five dollar per carton increase to the tobacco tax. A five per cent increase to the liquor markup. A four-cent increase to the locomotive fuel tax. A one percentage point increase on insurance premium tax rates. Together, with changes already implemented in 2015, this will provide an additional $1.5 billion in 2015-16 and approximately $2.3 billion per year for the next two fiscal years, helping government return to balance while protecting public programs and services. When all changes announced in the budget are fully implemented, Alberta will still maintain an overall tax advantage of at least $8.5 billion. Prudent management of expense growth at two per cent each year over the next four years, as revenue grows by an estimated six per cent each year over the same period. A salary freeze for Cabinet ministers, MLAs and political staff for the entire term of this Legislature. A comprehensive review of Alberta’s Agencies, Boards and Commissions. Hiring restraint across the Alberta Public Service. A new Fiscal Planning and Transparency Act that will limit government debt to 15 per cent of nominal GDP—half the average of Canadian provinces.